José MENOR (www.josemenor.net ) Recognized as “the great ambassador of Spanish music” (Melómano Magazine), he is both an acclaimed interpreter of core piano repertoire, and a sought-after performer of new music. His solo recital at Carnegie Hall in March 2016 received a standing ovation and was declared “impassioned and eloquent” by New York Classical Review, and his recording of the complete solo piano works of Joan Guinjoan was awarded four stars by Fono Forum Magazine. In 2016 Jose has been engaged in a worldwide tour commemorating Enrique Granados’ 100th anniversary. As Resident Pianist in Granados’ birthplace (Lleida), he opened the celebrations with a televised performance of Granados’ complete ‘Goyescas’. The tour included recitals at Carnegie Hall (New York), the ‘Meet in Beijing’ Arts Festival in China, Martha Argerich’s Lugano Project (Switzerland), St John’s Smith Square in London, and other venues in Germany, Spain, Switzerland and Italy. 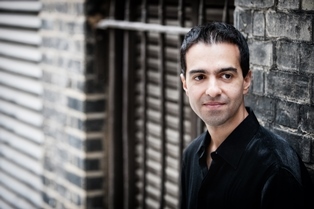 José is established as a prime interpreter of contemporary piano. He has premiered works by major composers including Hèctor Parra, Joan Guinjoan and Benet Casablancas. Recently he performed Parra’s complete solo piano works at the Schwetzinger SWR Festspiele in Germany and Barcelona’s Palau de la Música. As a composer himself, he has premiered works for piano and electronics in collaboration with video artist Francesc Martí (RMSOnce). José’s performance with the Royal Philharmonic Orchestra (RPO) of Albéniz’s ‘Concierto Fantástico’ was highly acclaimed by the international press, and launched premieres across the world. As a concerto soloist, he has appeared with orchestras including the Wuhan Philharmonic (China); Montevideo Philharmonic (Uruguay); Redlands Symphony (USA); Wroclaw and Bydgoszcz Philharmonics (Poland); Sinfónica de Xalapa (México), and major Spanish orchestras including RTVE in Madrid; OBC in Barcelona; and Simfònica del Vallès. As a recitalist, he has performed at venues such as the Wigmore Hall (London), the Auditorio Nacional (Madrid), and Carnegie Hall (New York). José’s extensive chamber music collaborations including Philip Setzer (Emerson Quartet), Ransom Wilson, Dai Miyata, Alexander Sitkovetsky and Francisco Fullana. His performances have been broadcast in America (CNN, WXEL, WWFM) London (BBC Radio 3), Germany (SWR2), Spain (TVE, RNE, Catalunya Música) and across Europe, as well as in Canada, Australia, Israel and Japan. In 2017, José’s CD featuring Goyescas will be released under the IBS Classical label. Among other recording projects, José will also be recording the complete works by Parra.